Save space and tidy-up your feeding area with the IRIS Wire Dog & Cat Canned Food Dispenser. This thoughtfully designed dispenser easily fits on the countertop, on a shelf, in the pantry or even in your refrigerator—anywhere you want to store canned food. To use, just load the wire model from the top and gravity will automatically dispense the next can at the bottom for easy grabbing. Made from PVC-coated heavy duty wire, this design is built to last. Multiple sizes lets you choose the item that best fits your needs. Designed to save space and help your feeding area look tidier and more presentable. 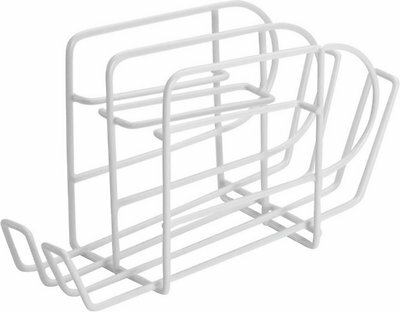 Made from PVC-coated heavy duty wire for a sturdy and durable frame. Perfect size for the countertop, on a shelf, in the pantry, or to keep in the refrigerator. To use, just load the wire model from the top and gravity will automatically dispense the next can at the bottom. Easy-to-clean, if this dispenser gets dirty you can quickly wipe it clean with a wet cloth. Clean using warm water and mild soap. We use a lot of 3 oz cans of wet food for our feral cats but the cans do not fit in this dispenser. I wanted to use this for storage and quick access to cans to feed our feral cats but the cans are hard to get out of this dispenser as it is too narrow to allow the cans to flow freely, perhaps not all cans are the same size? It's very convenient & usees less space in my cabnet than the cans stacked 2×2 and side by side! I'm glad I discovered it. Chewy is such c.v h a convenient way to shop & I love the home shipments! It's a real time saver. Holds the amount and size it claims. I ordered 2 of the same size and neither of them sit close to flat. Unfortunately the part that needs to be bent is very difficult to bent because the material is so strong. Would still recommend. Just beware ocd people if this will bother you because it's bothering me. This makes it so much easier to store cans of cat food without towering them in the cabinet. Easy to grab one whenever you need. Only problem I had was that I ordered 2, and one of them came bent at the top making it slightly difficult to put the cans in. Other than that, love them! Bought the 3oz sized rack, and it fits my 2.8oz cans of tikicat wet food perfectly! Couldn't be happier with the organization this product has provided for my cupboards! I love this product! Keeps my 3oz cans of cat food organized and easy to see. I love that the cans smoothly roll to the front when I grab one and they don't get stuck or fall out. I love this. Keeps Mr Meow Meow's food nice and neat. I can load it in the order he likes and keep track of how many cans he has to go before I load it again. 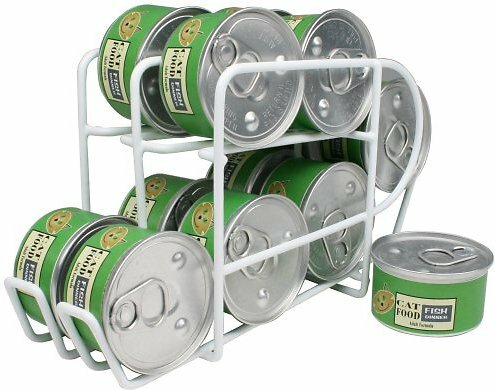 This is great for organizing my cat's canned food. I switch between two flavors and keep this on top of my fridge, so it makes it a lot easier to start a new can versus reaching into the cabinet to struggle with the cartons of cans. Be mindful that it's for 5.5oz cans though, unsure how well it with work with other sizes. Doesn't hold canned food, much less dispense it. I can't imagine which 5.5 oz cans of what are supposed to fit in here... much less 12 of them. Works like a charm and effective in holding the cans .